As early as 3 months of age, infants with a severe form of epilepsy called Dravet syndrome start having convulsive seizures, during which their arms and legs jerk repeatedly. As they become toddlers, another type of seizure begins to appear. These seizures do not cause obvious convulsions, but disrupt consciousness and can occur more than 50 times every single day. A challenge to detect and difficult to treat, these non-convulsive seizures often go unnoticed by parents and physicians. A recent study, published in the journal Cell Reports, characterizes these silent seizures in a mouse model of Dravet syndrome and identifies the brain area that could be targeted to stop them. "We were able to pinpoint the exact spot in the brain that causes the seizures," said Jeanne Paz, Ph.D., the senior author of the study, who is an assistant investigator at the Gladstone Institutes. "This discovery allowed us to develop two new strategies to prevent these non-convulsive seizures in mice simulating Dravet syndrome." By collaborating with Maria Roberta Cilio, MD, Ph.D., a renowned pediatric epileptologist at UC San Francisco, Paz confirmed that her findings are likely relevant to the human condition. 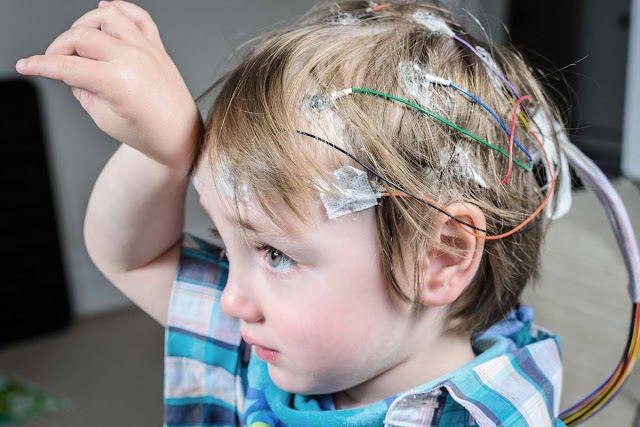 "If we could successfully eliminate non-convulsive seizures in children with Dravet syndrome, we could significantly improve their quality of life," said Cilio, director of research at the UCSF Pediatric Epilepsy Center. "We could finally offer them the best conditions in which to reach their full potential." Nearly 8 in 10 patients with Dravet syndrome have a genetic mutation that causes both developmental delays and seizures, which can even lead to sudden death. Affected children also have cognitive deficits, sleeping difficulties and autism-like behaviours. Neurons are highly specialized brain cells that send signals to one another, forming complex network that enable both basic and higher brain functions. When a neuron "fires," it releases a signal that carries instructions for the receiving cell. While excitatory cells instruct the next cell to take action, inhibitory cells send signals to suppress the activity of receiving cells. Seizures are caused when excitatory cells function too strongly or inhibitory cells function too weakly—both of which result in too many cells in the brain getting excited at the same time. Previous animal studies had shown that convulsive seizures are caused when inhibitory cells are not sufficiently active in a brain region called the cerebral cortex. Since then, the scientific field has focused on finding treatments to enhance the function of those cells. Paz and her laboratory, on the other hand, study a different region of the brain: the thalamus. This region plays a major role in cognition, sleep, attention, and consciousness. "All of these elements are altered in patients with Dravet syndrome in a way that is unlikely to be caused only by changes in the cerebral cortex," explained Paz, who is also an assistant professor of neurology at UCSF. "We wanted to see what happens in this brain region and how its cells might be altered in the context of this syndrome." The researchers were expecting inhibitory cells in the thalamus to be less active, similarly to those in the cerebral cortex. Surprisingly, they saw the opposite. "We found that the inhibitory cells in the thalamus were quite active in mouse models of Dravet syndrome," said Stefanie Ritter-Makinson, Ph.D., one of the lead authors of the study and a former postdoctoral scholar in Paz's laboratory. Working closely with fellow lead author Alexandra Clemente-Perez, Ph.D., Ritter-Makinson used electroencephalography, or EEG, to record brain waves and detect abnormalities in brain activity in mice with Dravet syndrome. They also observed that these non-convulsive seizures were much more frequent than convulsive seizures, occurring hundreds of times each day in some mice. That's when Paz reached out to Cilio, an expert in the diagnosis and treatment of genetic epilepsies in young children, to confirm those equivalent seizures are seen in human patients. "Maria Roberta confirmed that she witnesses the same types of seizures in her patients, and shared some human EEG recordings with us," said Paz. "We compared the human and mouse recordings side by side, and we were surprised to see how closely they matched. We were encouraged that our work could translate to real people, so we went on to look for ways to stop the seizures." The non-convulsive seizures are in some cases called "atypical absence seizures." Atypical, because they last longer—10 to 30 seconds on average—than those seen in children with typical absence epilepsy. Absence, because the patients appear as if they are mentally absent during the attacks, as they lose consciousness but without collapsing. Paz refers to these seizures as "silent" given that they can go unnoticed without an EEG recording. When a child is experiencing an absence seizure, she or he will seem absent-minded, staring blankly into space. This can be perceived as the child not paying attention, but can have many detrimental effects in daily life. "Imagine you have several 20-second blanks while I'm talking; you'll get a sense of what I'm saying, but you won't understand all of it," explained Cilio. "Although they may not be as dramatic as convulsions, these interruptions can happen regularly throughout the day, so they really impair learning." Non-convulsive seizures in patients with Dravet syndrome are particularly difficult to treat compared to other types of seizures. Even the latest treatments are not effective in preventing or stopping them. For instance, cannabis-based drugs (for which Cilio is a leader) can reduce the number of convulsive seizures, but have little impact on the frequency of silent seizures. In the new study, Paz identified two ways to stop non-convulsive seizures in mice. First, she and her team manipulated the activity of specific neurons in the mouse brain using optogenetics, an approach that makes it possible to control the activity of neurons with laser light. They developed methods to detect seizures, and upon detection, quickly changed the activity of neurons in the thalamus to stop the seizures. "This approach allowed us to identify the specific cells and brain activity required for initiating and aborting non-convulsive seizures in models of Dravet syndrome," said Paz. "It had been difficult to do this in the past, because seizures involve a very large network of cells that ping-pong signals all around the brain within milliseconds. So, it was crucial for us to detect them immediately at their place of origin." Optogenetics cannot be used in humans yet, so Paz looked for a pharmacological drug that could achieve the same result. She found that a drug named EBIO1 reduced the firing of inhibitory cells in the thalamus. When Dravet model mice were treated with this drug, their seizures were markedly reduced and, in some cases, even stopped. "It is very exciting that an FDA-approved drug already exists that targets the very brain activity we found to cause non-convulsive seizures," said Paz. "To our knowledge, it has never been used in epilepsy, but no side effects were reported when it was used in clinical trials for movement disorders." When a drug has already been approved for safety by the US Food and Drug Administration (FDA), it can be made available to patients much more quickly. The study by Paz and her team identified a drug that treats non-convulsive seizures through its action on the thalamus, and may explain why anti-seizure medications that do not reduce thalamic activity are not effective in stopping these seizures. "Jeanne's work identified a completely new target area in the brain for treating Dravet syndrome," said Cilio. "Her study is an example of truly translational work, where a basic research effort could directly impact patients in the clinic." "We tried two different methods," said Paz, "optogenetics could be an option for the future, while the drug could be made available to human patients soon." "When I presented my findings recently at the American Epilepsy Society, some physicians expressed keen interest in testing this FDA-approved drug in the clinic." Paz added, "hopefully, this will be life-changing for these children."